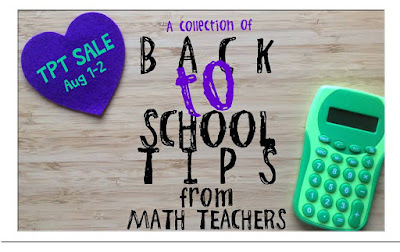 Since I've been rethinking how to "do math" this year, I'm so excited to join with my math bloggy buddies for Back to School math tips! As soon as school begins, we will be spending a good deal of time on developing our community and culture of learners, as well as establishing routines. With 32 energetic fourth graders, I need time to conference with students individually, as well as meet with smaller groups of students. So how do I organize? 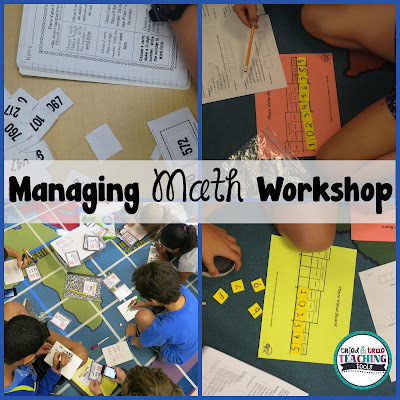 I use MATH; an acronym that stands for: Math facts (or Math book since we technically have to use it), At your seat, Teacher-time, and Hands-on activities. Before each new unit of math, my students take a pre-test. Depending on their pre-test results, I group them into four polygon groups: hexagon, square, triangle, circle. These groups are labeled by their number of sides according to their math needs. (hexagon has 6 sides, so my kids with the most needs are in this group, next the square group with 4 sides, then triangle, and my circle group with no sides does not need remediation). Of course my students do not know why they are in specific groups. However, they do know that groups will change with every new unit, depending on what they need. My kids know that they are always given work they need, even though it may look different than their classmates. I don't have much wall space or bulletin board space in my room, so I made my signs to fit on a cupboard door. I have 4 groups and usually get to 2 rotations per day: 1/2 hour with each group. I know some teachers see all 4 groups daily for 15 minutes each, but I can't seem to manage to thoroughly work with my students that way. The first row of polygons has numbers on them. These are student numbers so I (and they) can quickly see which group each child is in. Then the arrow gets moved down as rotations progress. At the bottom of the rotations are each individual group's assignment boards/menu. Students look at the Must Do column first, during their designated rotation. After that, students move to the May Do column. 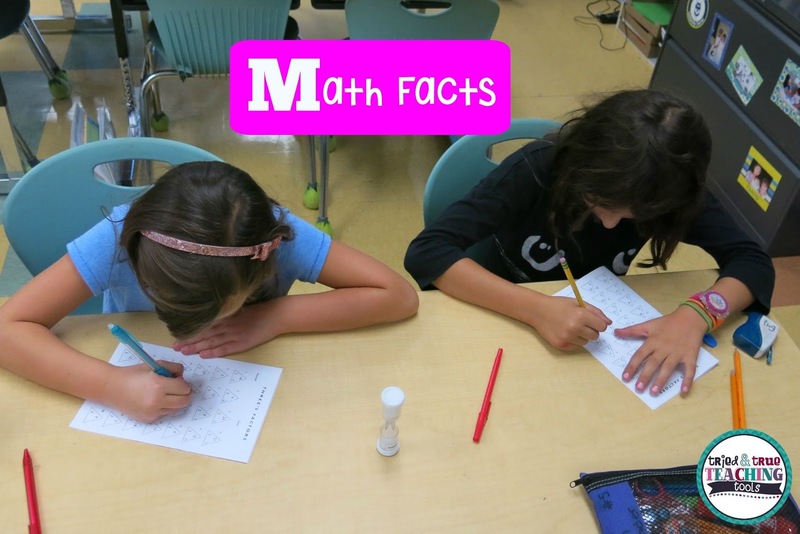 During Math Facts time, students work on triangle math facts tests (www.newmanagement.com), triangle flash cards, and other math facts games. 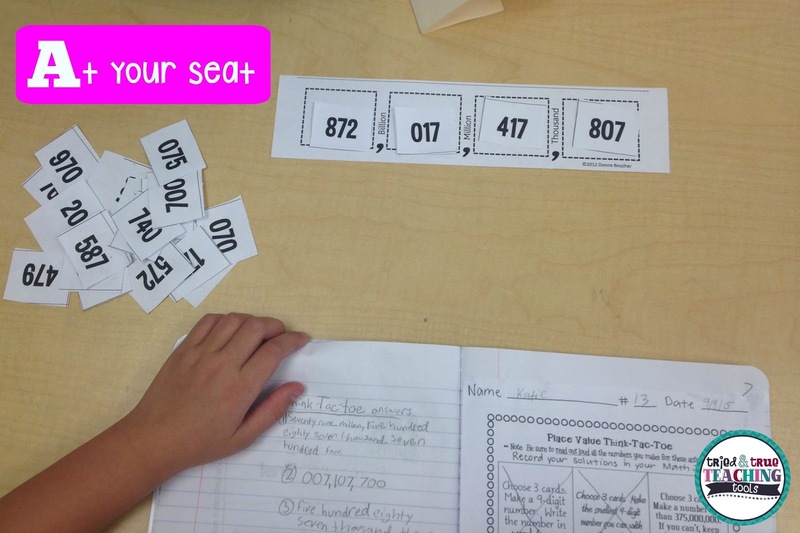 During "At your Seat" rotation, student might work on their math workbook or various math menus I've created. You can read more about them here. The Teacher Studio has numerous resources that are wonderful for At your Seat time. I especially love her Digging Deeper Perseverance Problems! Also check out Math Coach's Corner for tons of fantastic activities that kids can do independently (see place value game picture below). Many of these are also used during Hands-on time. During Teacher Time, we do a lot of practice on mini-whiteboards, as well as I started to teach them how to use QR code task cards. Once they can do these independently, the task cards are then moved into Hands-on May Do choice. I also use this time to take anecdotal notes on the progress of each student. One of my favorite hands-on resources are Marcy Cook Tiles. They not only allow kids to practice math skills, but they must use logic and number sense in order to solve. 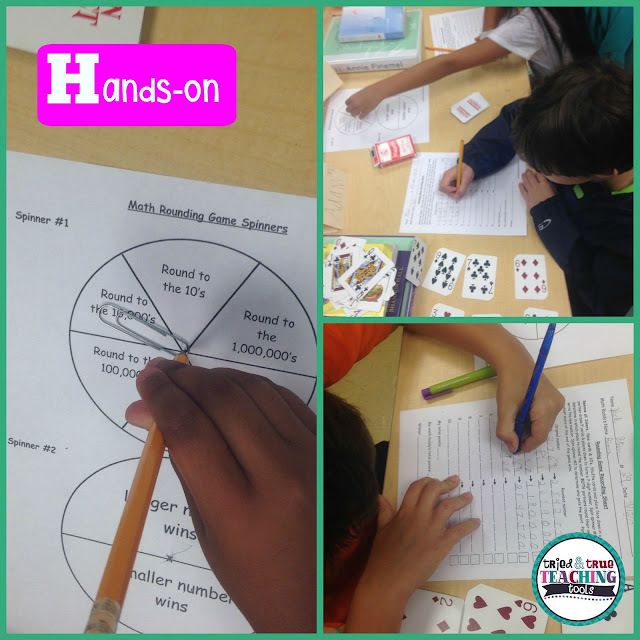 During Hands-on time, students also play games with partners. You can download this fun partner rounding game (below) here. You can get your Math Workshop signs at my TpT store here. (And they're on sale August 1st & 2nd! Use code: BestYear) Stay tuned this year; I'm going to be making many changes during math, including meaningful conceptual work. How do you organize for Math Workshop and differentiate for your students? 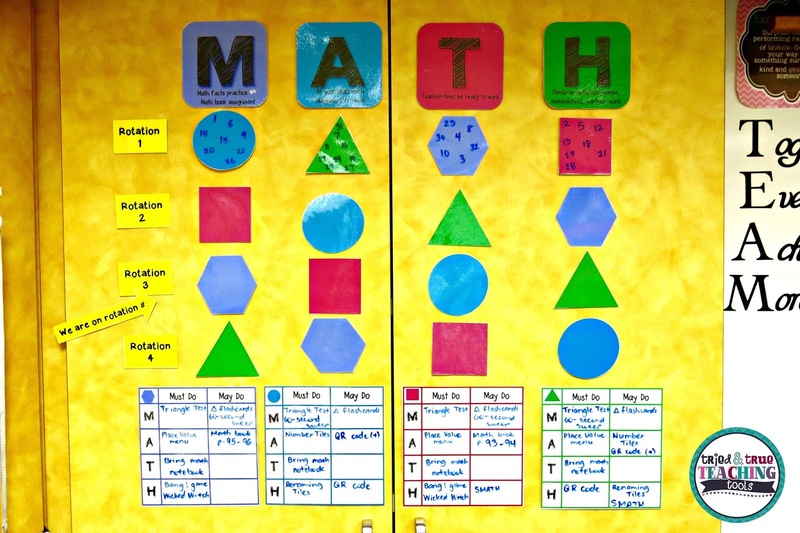 I went to a Debbie Diller math workshop a few years ago and use a modified version of her math centers idea in my classroom. I love that you call your groups by shapes... I am totally stealing your idea for my groups this year! I don't use an acronym, but I do Teacher Time, a hands on center activity, and a technology center where my students do Reflex Math or another app on the iPad. Thanks for all of your great ideas! I love Debbie Diller's literacy centers! I'll have to check out Reflex Math, too. Thanks so much for stopping by!